Mountain Melody Women’s Chorus is known around Calaveras County known for their beautiful harmonies and lush, blended tones. Next year in 2019, the Choir will be performing as part of a large international choir on stage at Carnegie Hall in New York City!! The Chorus is extremely proud and excited to be asked to perform at this event and to represent Calaveras County. So please join us at one of our Christmas concerts on December 8 and 9, or look for us at one of the other events listed below. Please help support us in our journey to NYC and the stage at Carnegie Hall! 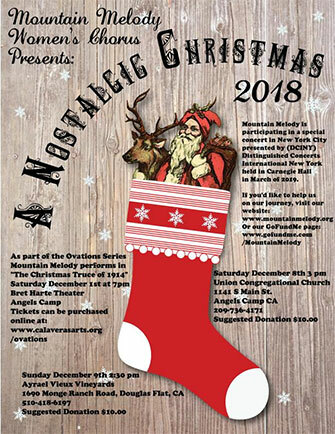 Another exciting development for Mountain Melody is our participation in the Ovations series as a part of their play “The Christmas Truce of 1914” by Alan Shepard. Kathy Mazzaferro directs this surprising and sensitive story, with actors from Once Upon a Time Productions. Click here to purchase tickets online..
We will have fundraising at each of these performances. Call Tari Takara 209-754-9180 for more information. in NYC at Carnegie Hall in March of 2019!! Yet another extraordinary Mountain Melody event is our participation in a special concert in New York City presented by Distinguished Concerts International New York (DCINY) and held in the legendary Carnegie Hall in March of 2019. Mountain Melody is so excited to be participating, and if you’d like to help us on our journey, please go to our GoFundMe page. We are looking forward to this event at Carnegie Hall with great anticipation, and as always, we are so grateful for the support we have and will continue to receive.